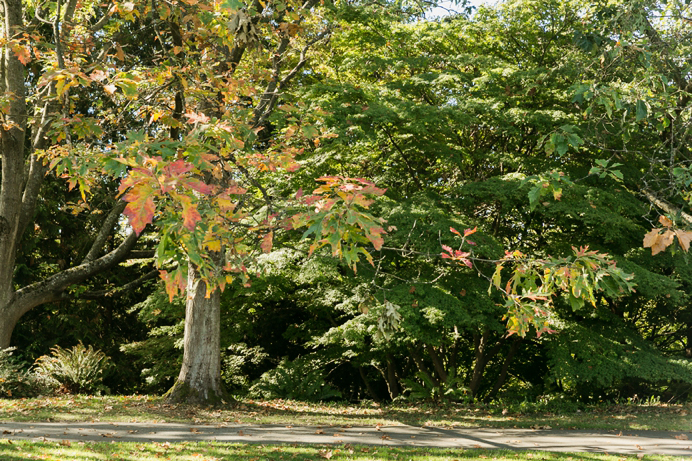 Vancouver is beautiful in the early fall. 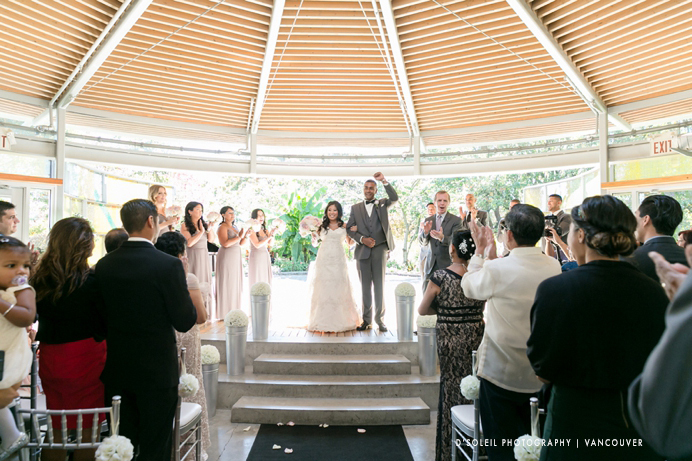 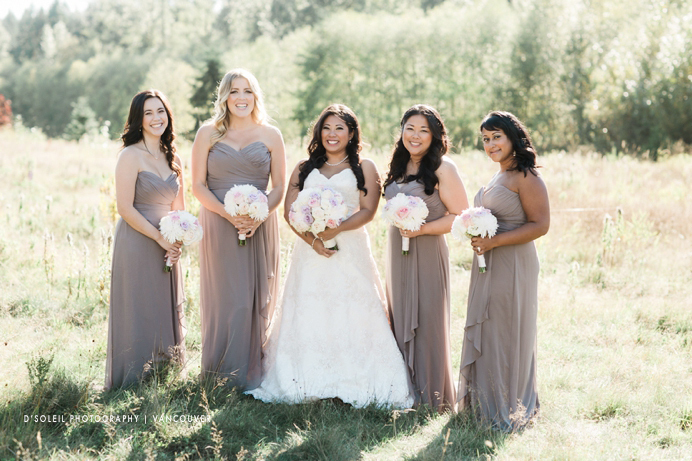 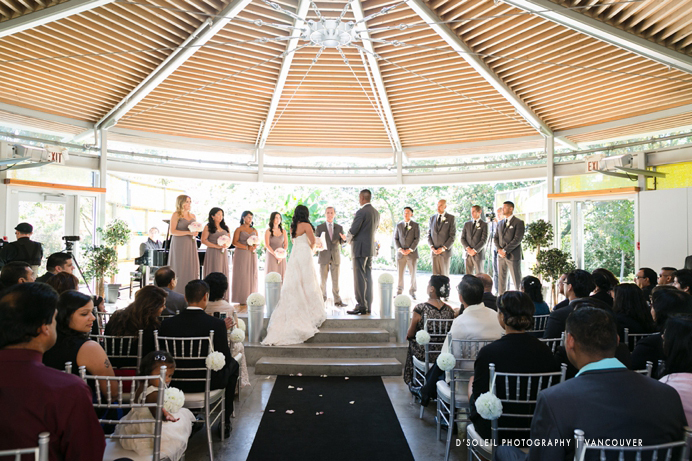 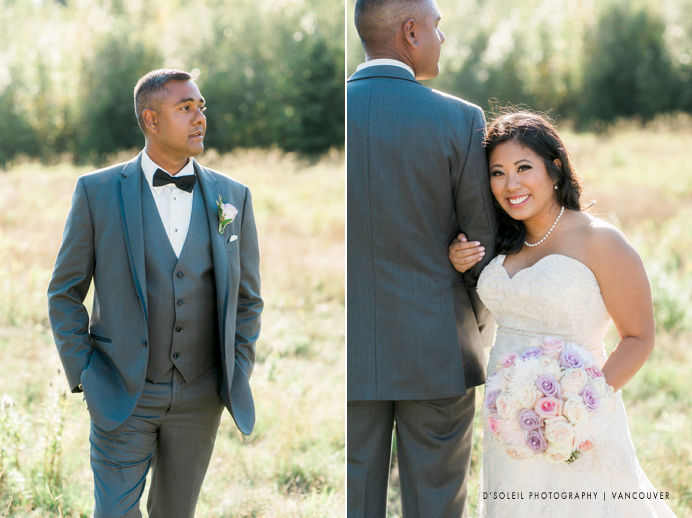 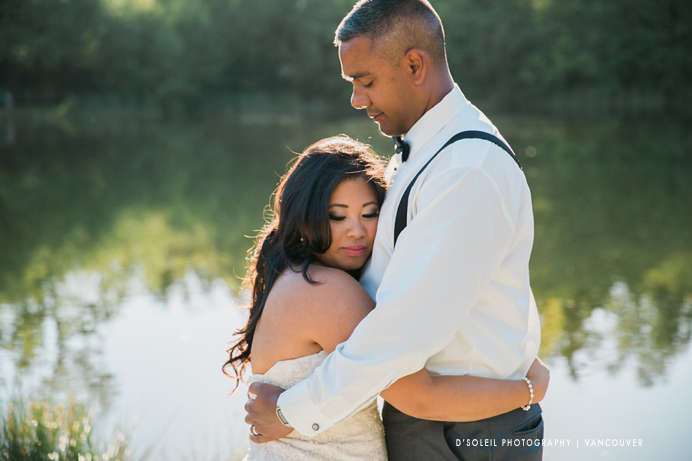 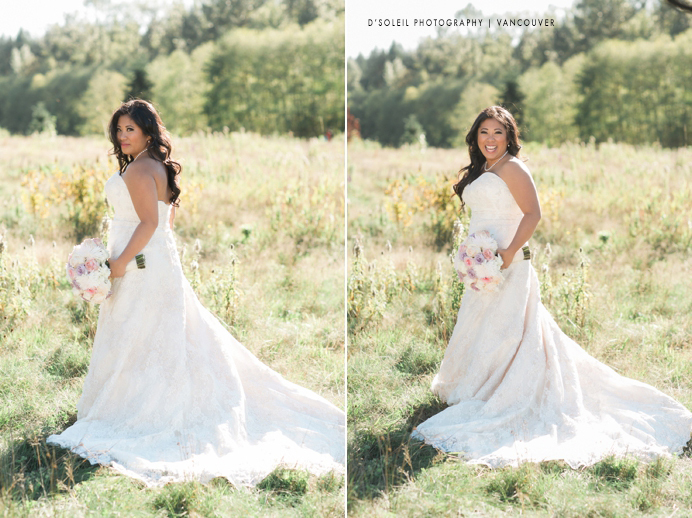 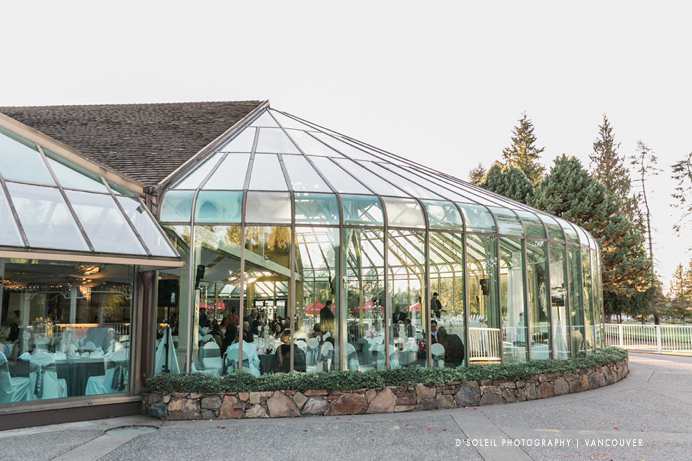 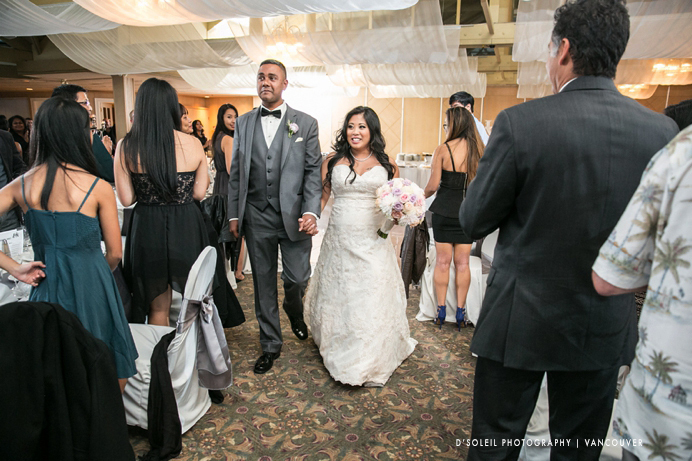 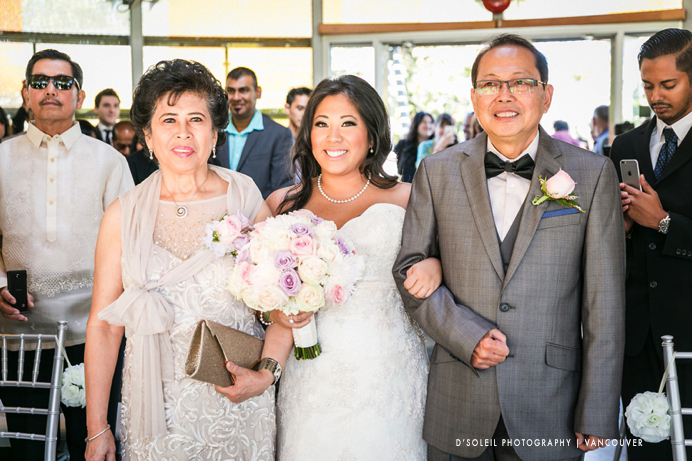 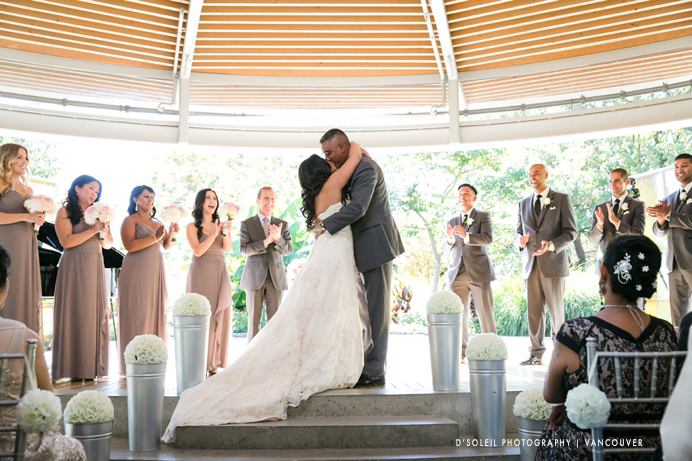 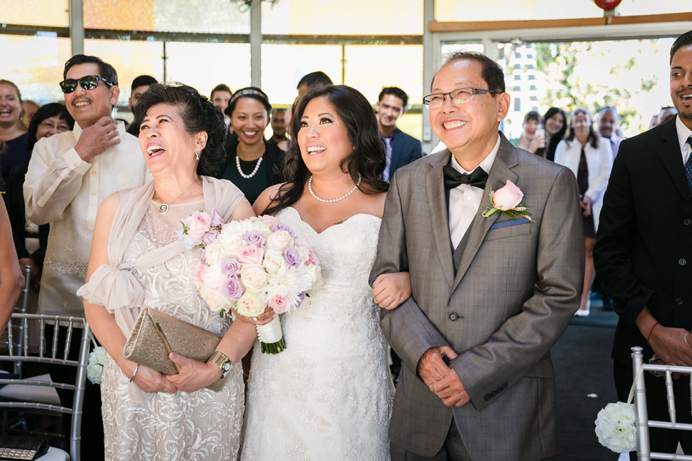 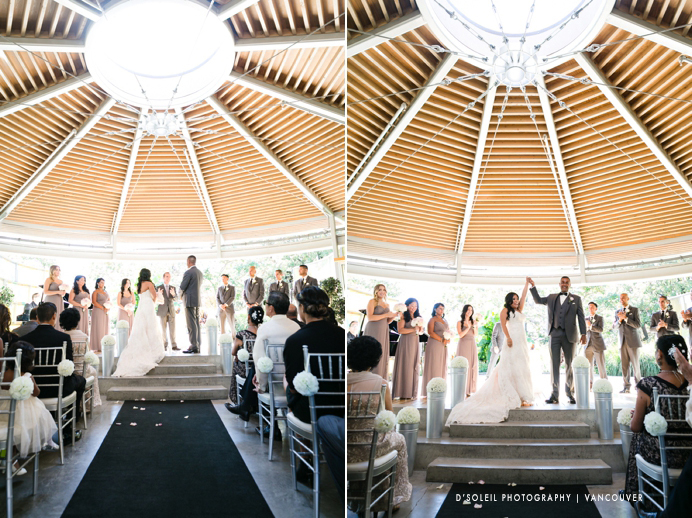 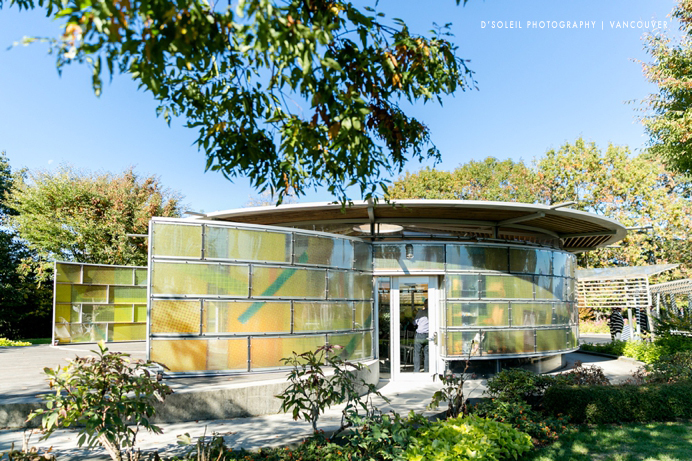 An example is Roma + Andrew’s Celebration Pavilion and Newlands Golf Club wedding in Vancouver and Langley. 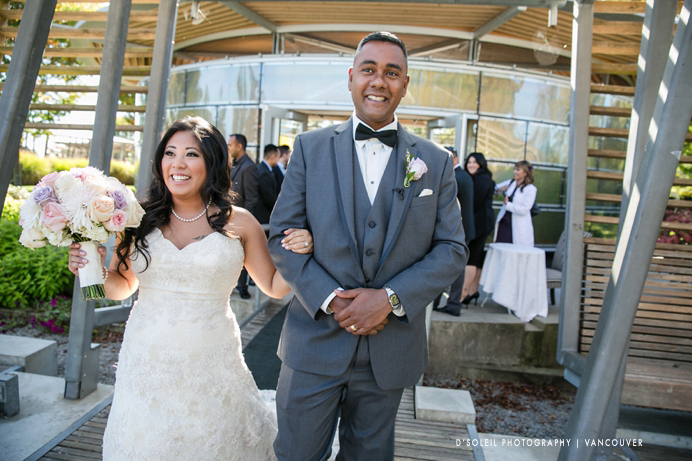 On a beautiful October day, Roma and Andrew made their vows atop the highest point in the City of Vancouver at Queen Elizabeth Park. 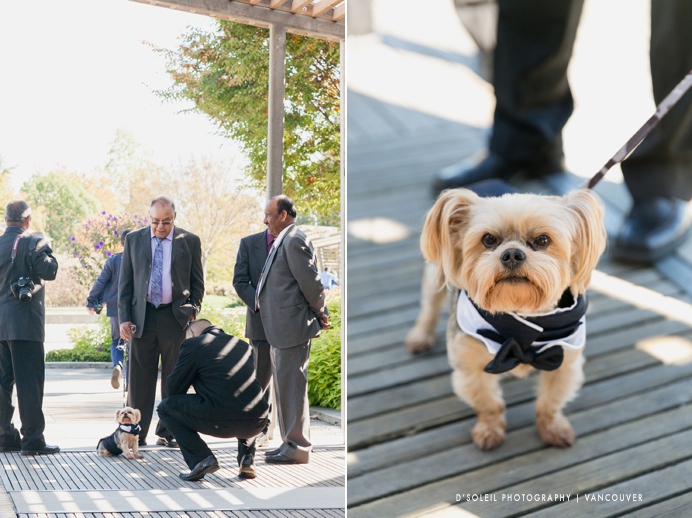 Formal attire is usually expected of wedding guests, but at Andrew and Roma’s wedding, even their dog was well dressed. 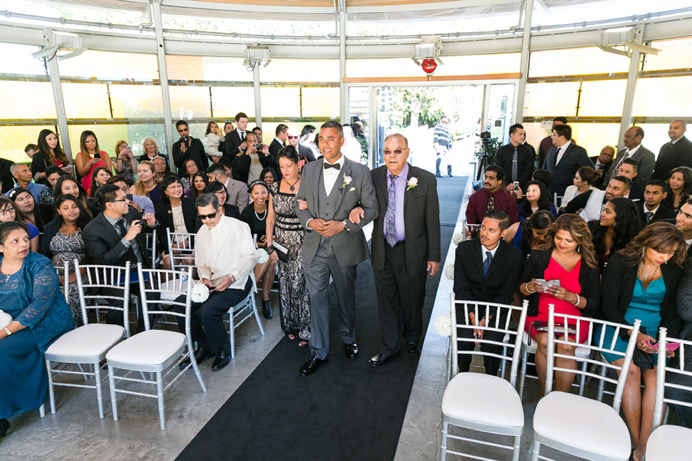 Both Roma and Andrew were walked down the aisle by their parents, which is something that you don’t see too often, but it is always cool to couples give respect tot their parents on their big day. 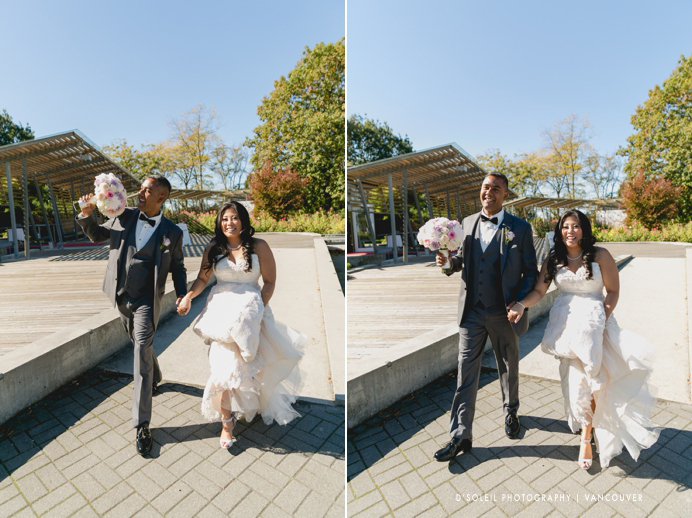 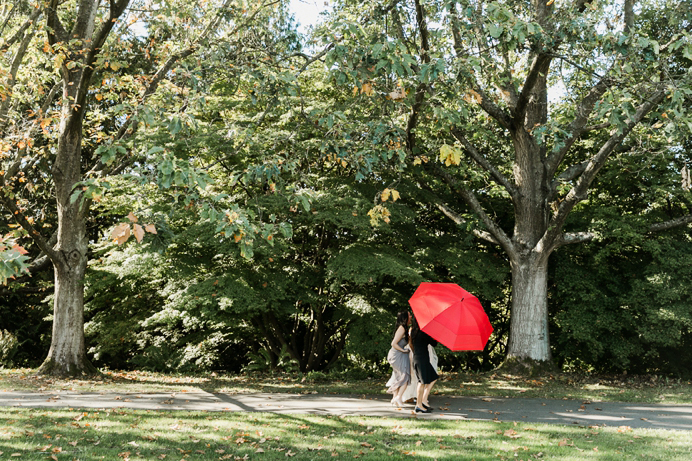 Following the wedding ceremony at Celebration Pavilion and family photos at Queen Elizabeth Park, we drove to downtown New Westminster for photos with the entire wedding party. 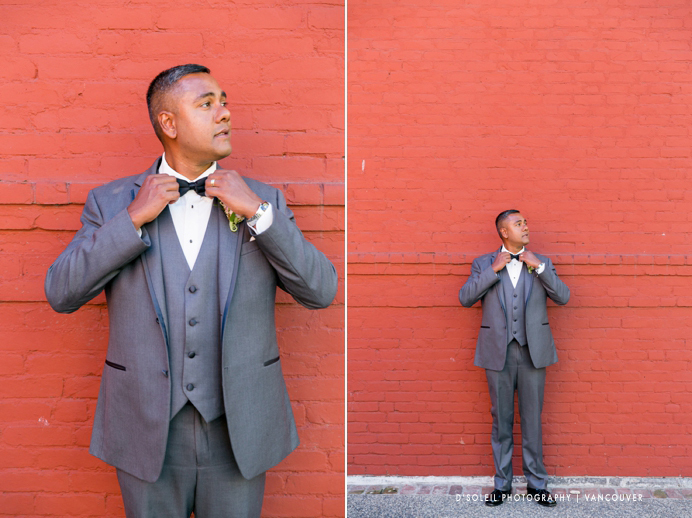 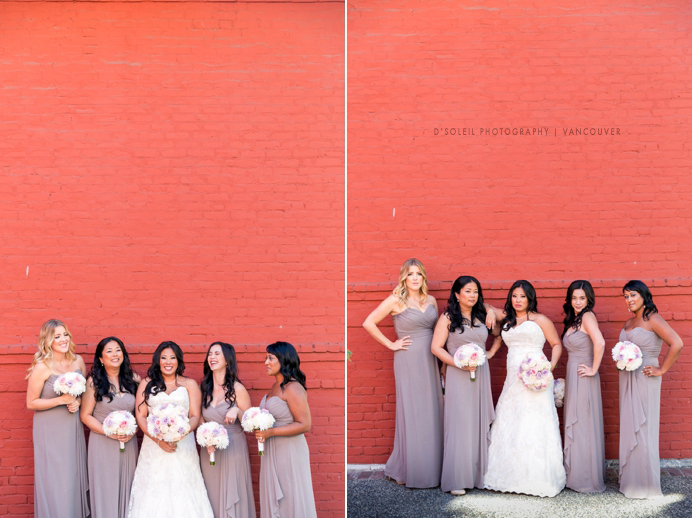 I located this cool red brick wall, and knew we had to take photos of the groomsmen and brides maids along the wall, as requested by the groom. 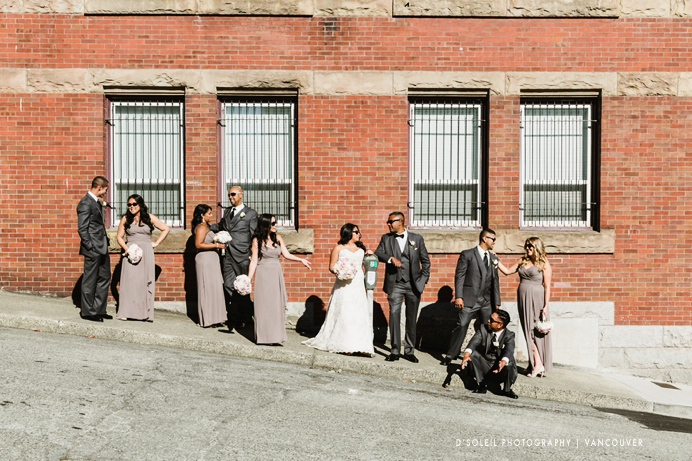 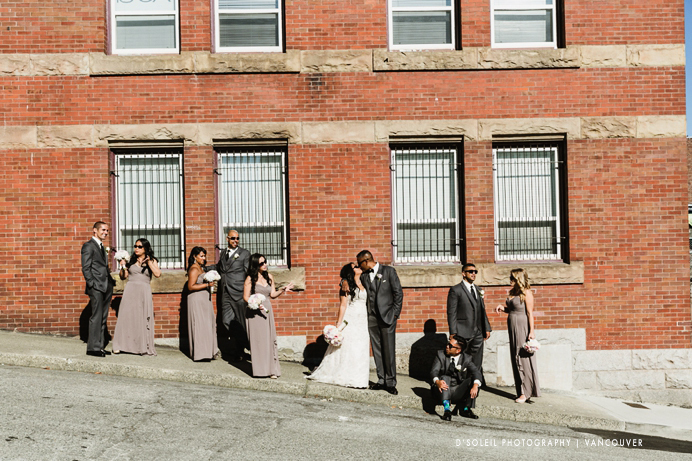 New Westminster still has a number of bool brick buildings, which made a great backdrop for a large wedding party. 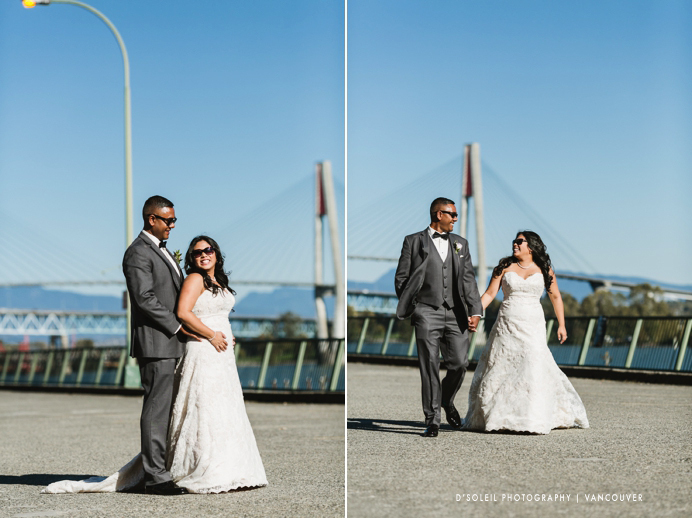 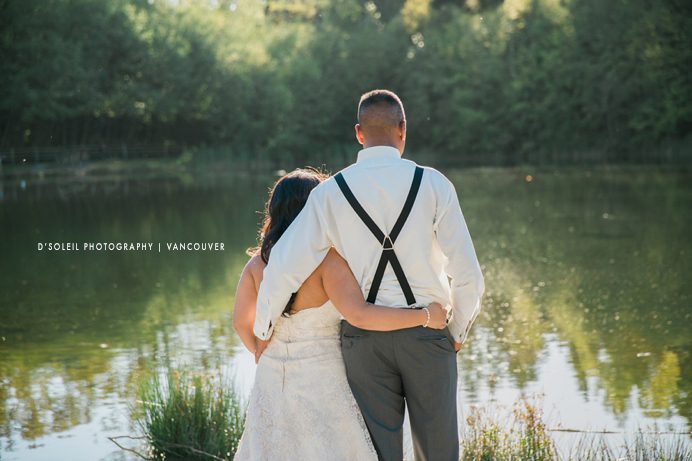 Then we went to New Westminster Quay for more wedding photos with its mix of vintage and modern industrial landscape. 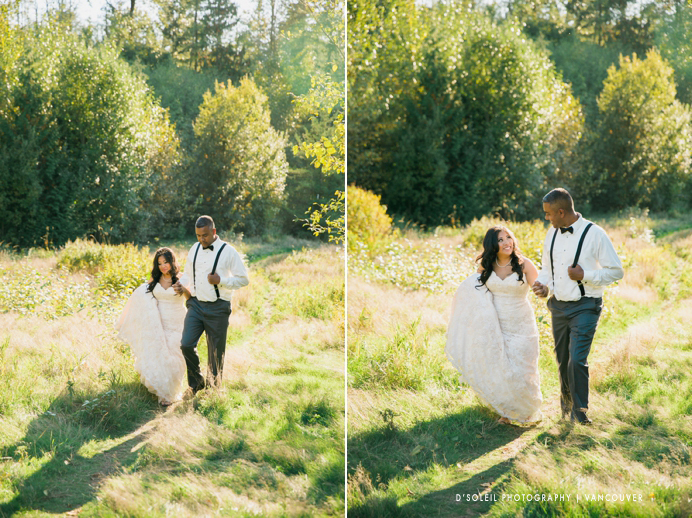 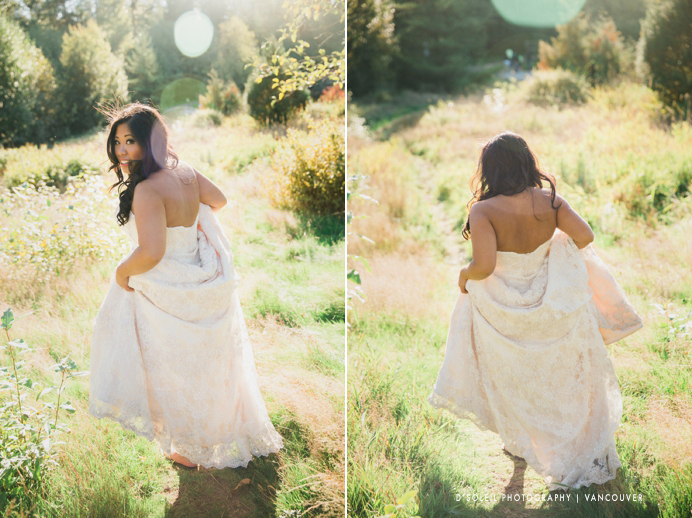 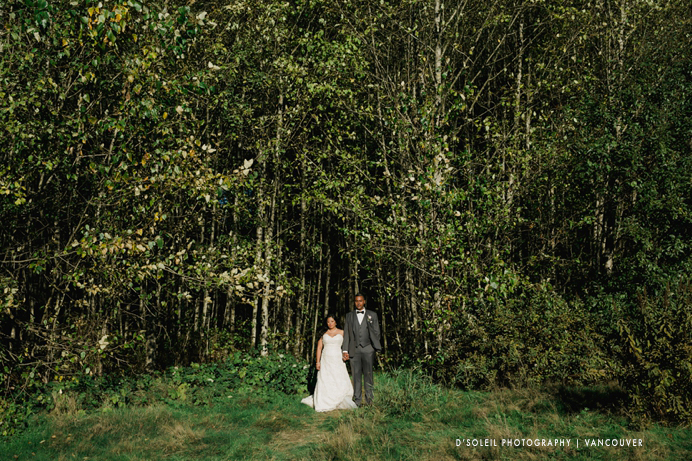 We pre-identified this beautiful park in Surrey, and met up with the wedding party their for a photos in a country-like nature setting. 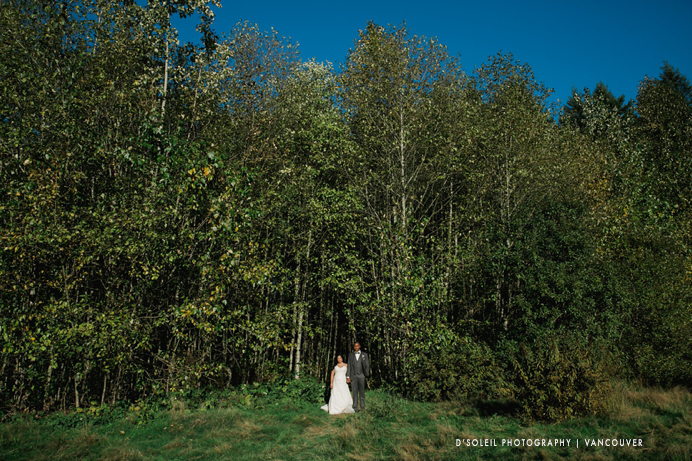 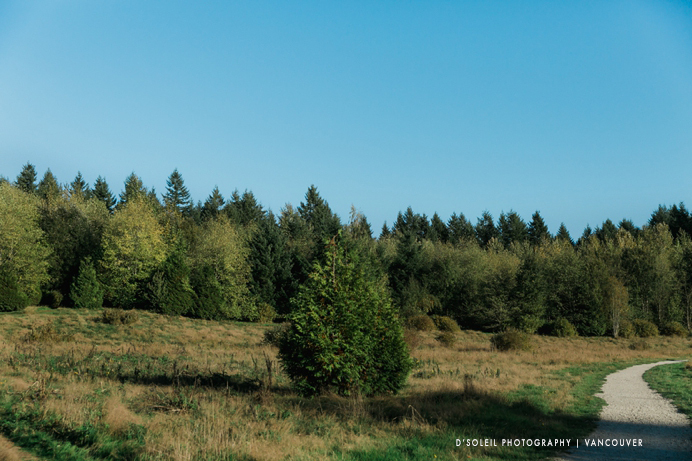 I especially loved this open field, where we spent some time making sure to photograph the bride and groom, and bridesmaids too. 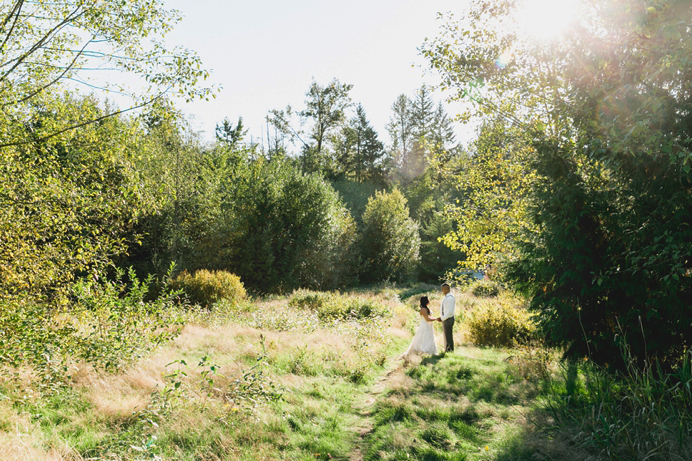 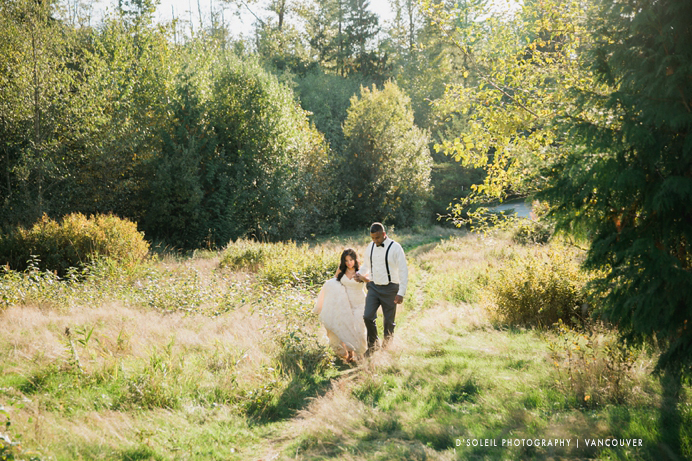 My favourite spot was a little meadow in the park, where the bride and groom spent a little time in the field and nearby lake. 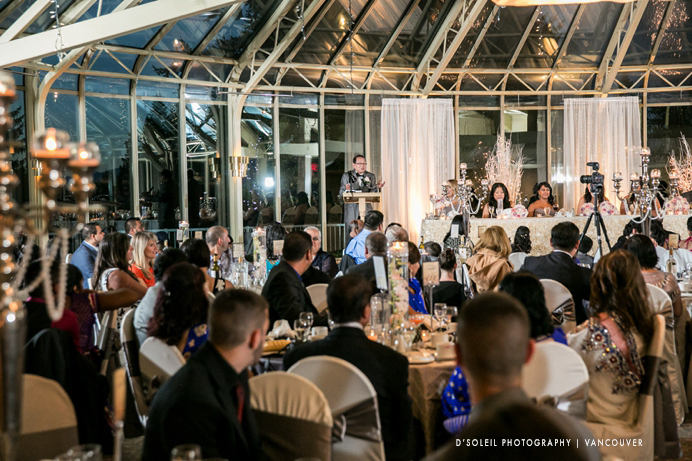 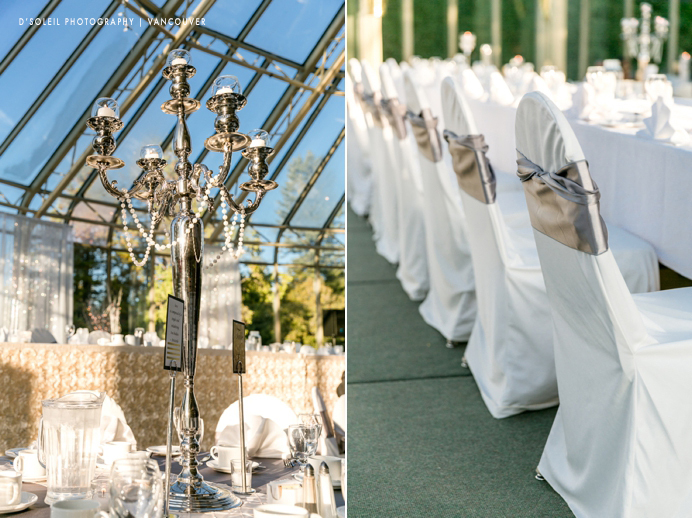 For their Newlands Golf Club wedding, their reception was held in the Conservatory Ballroom. 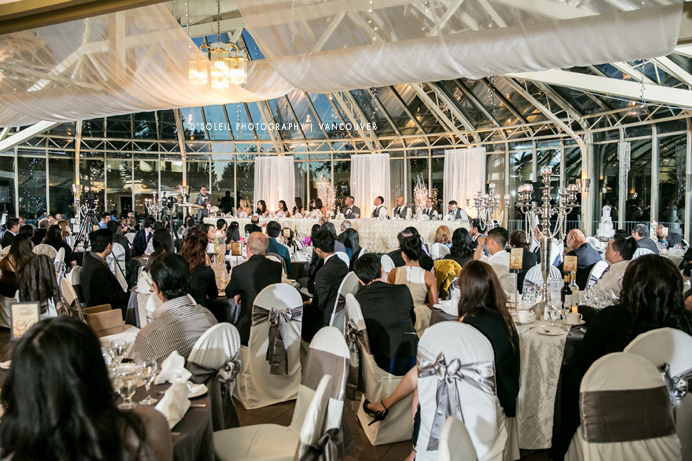 The wedding day and decor work was coordinated by none other than Stephanie Jung, a close friend of the bride and a previous client of mine as well. 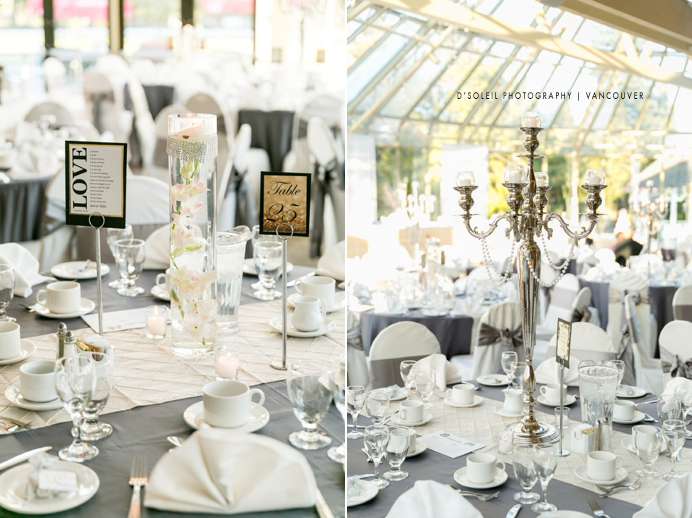 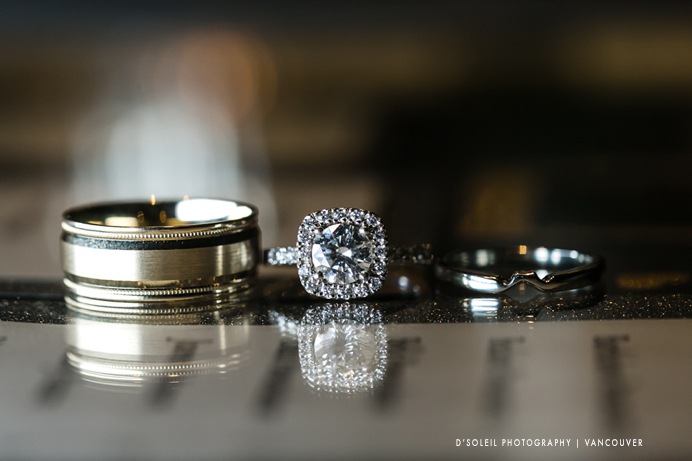 The decor was beautiful and magical, perfectly fit for a wonderful couple to impress their guests. 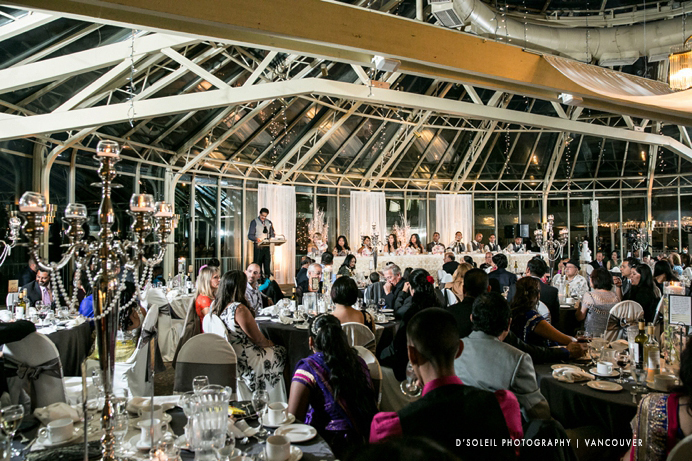 Everyone was in awe over how well the wedding venue was decorated. 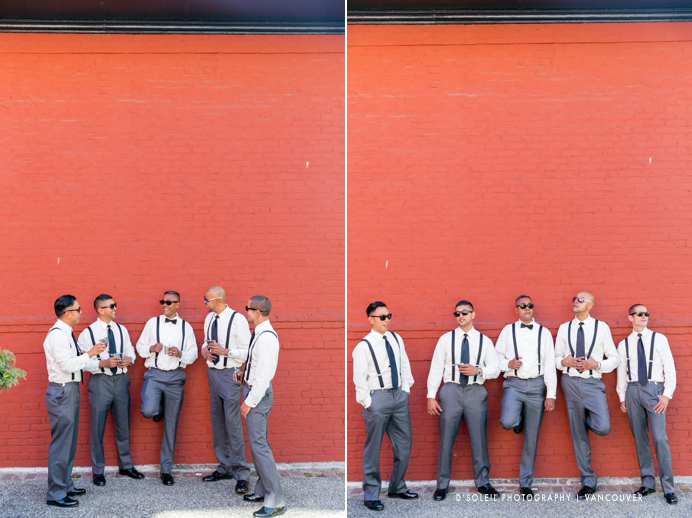 It was absolutely eye candy! 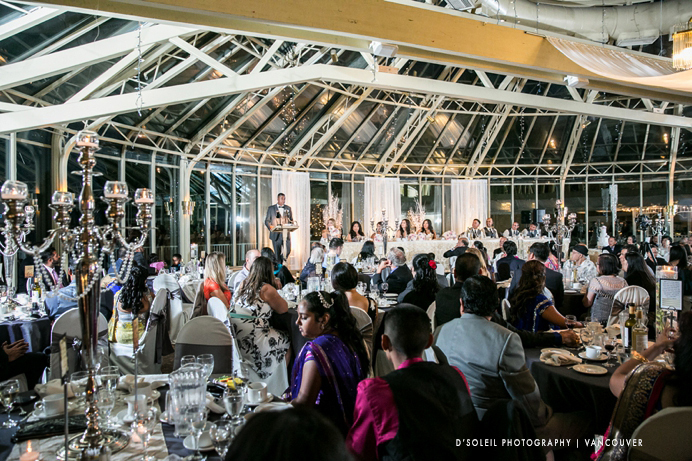 The wedding cake was also a feast for the eyes. 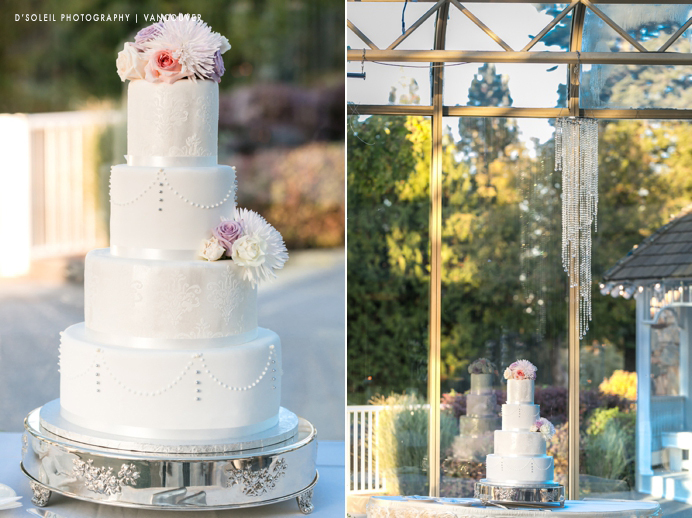 I loved how the evening sunlight lit up this simple and elegant cake. 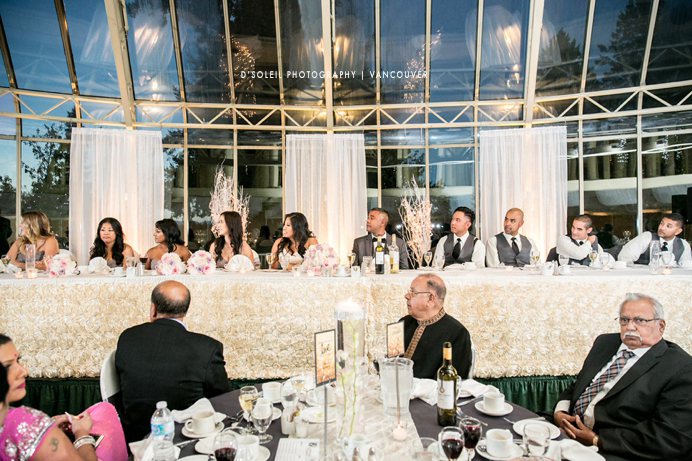 Before their buffet dinner, friends and family offered their toasts to the bride and groom. 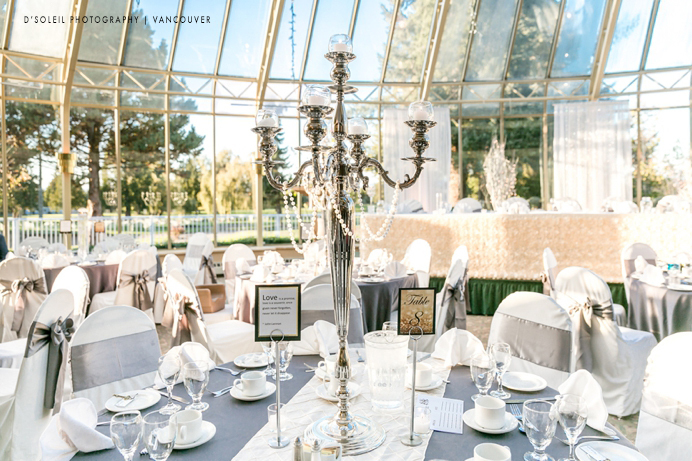 The window reflections from the hanging lights and candelabras inside the Newlands Conservatory Ballroom made the space look and feel magical as the sun set over the golf course.